JC9781. Barite. Willow creek, Freighter spring, Mount Borah, Lost River range, Custer county, Idaho. 3 x 6 cm 104g. $8.00. Little group of crystals from this obscure location in Idaho. JC9782. Barite. Willow creek, Freighter spring, Mount Borah, Lost River range, Custer county, Idaho. 3 x 5 cm 67g. $5.00. Little group of crystals from this obscure location in Idaho. This was trimmed off a larger piece and has a small saw mark on the lower bottom edge of the front. JC9734. Barite. Retaguardia mine, La Union, Sierra de Cartagena, Murcia, Spain. 3 x 4.5 cm 53g. $10.00. Collected 2009. No obvious damage to the front display side. JC9736. Barite. San Pedro mine, Sierra de Enmedio, Almendricos, Lorca, Murcia, Spain. 3.7 x 4 cm 49g. $15.00. Collected 2010. No obvious damage. JC9736. Back side. Not sure what the brown mineral is...siderite? JC9522. Barite. Willow creek, Freighter spring, Mount Borah, Lost River range, Custer county, Idaho. 4 x 5.5 cm 94g $8.00. Three cleaved crystals present on this one. One is just left of the large crystal on the right edge in this view. The larger crystal is 1.4 cm across. Another cleaved crystal is on the left edge, and one in the back is also cleaved. Hard to spot in the photos. JC9523. Barite. Willow creek, Freighter spring, Mount Borah, Lost River range, Custer county, Idaho. 3. x 3.5 cm 102g. $8.00. Ding on tip of crystal and small chatter marks along the edge. Indentation from another crystal, now gone, on the lower front. Luster is bright satin, almost glassy. Color is the usual light amber. JC9526. Barite. Willow creek, Freighter spring, Mount Borah, Lost River range, Custer county, Idaho. 3.5 x 5 cm 82g. $10.00. 2.5 cm main crystal shown here. The crystal in front of the main crystal has a ding on its right corner, visible in the photo. Luster is bright satin with pale amber color. JC9527. Barite. Willow creek, Freighter spring, Mount Borah, Lost River range, Custer county, Idaho. 4 x 5 cm 90g. $8.00. Sawn base. Chipped corner on one crystal. Some broken crystals on back. Glassy luster, with slightly grayish light amber color. JC9527. Another view showing the cleaved off crystals on the side of the specimen. JC9527. View of best display angle. JC9528. Barite. Willow creek, Freighter spring, Mount Borah, Lost River range, Custer county, Idaho. 7 x 9 cm 345g. $35.00. One cleaved crystal on the lower front in this photo, near the bottom of the specimen. Some broken crystals on the edges of the specimen. There is another small cleaved crystal on the left center, hard to see in this photo. The larger top center crystal has rub marks/chatter marks along the back edge, not all that noticeable. Luster is bright satin, and pale amber color with some gray tinges here and there. JC9529. Barite. Willow creek, Freighter spring, Mount Borah, Lost River range, Custer county, Idaho. 9 x 10.5 cm 630g. $40.00. Several broken/cleaved crystals on the edges of the specimen. Bright satin luster with pale amber color. JC9530. Barite. Willow creek, Freighter spring, Mount Borah, Lost River range, Custer county, Idaho. 7 x 10.5 cm 481g. $50.00. Chip on back edge of the main crystal. The main crystal measures 3.0 cm wide. Color is pale amber with smoky gray areas near the centers of the crystals. One of the best medium sized cabinet specimens with nice glassy luster to the crystals. JC9535. Barite. Willow creek, Freighter spring, Mount Borah, Lost River range, Custer county, Idaho. 12 x 16 cm $150.00. >1000g. Approximately 3.5 cm crystals with a cleaved larger crystal on the top of the specimen just to the right of the edge on crystal on the top center. The crystal in the left front of the specimen on the lower left has been cleaved off. This was a large specimen with quite a bit of matrix with broken crystals on the back and base, so it has a sawn base and back to get rid of the 10 Lbs or so of bad matrix. The left edge in this photo has several broken/cleaved crystals visible in the photo. JC9535. Another view, with the cleaved crystal on the top edge. JC9535. Another view, the cleaved crystal is easily visible in the lower center of the photo, just below the edge on crystal above it. JC9536. Barite. Willow creek, Freighter spring, Mount Borah, Lost River range, Custer county, Idaho. 6 x 6 cm 129g. $10.00. A 3 cm crystal with smaller crystals. Slightly frosted looking main crystal. A couple of dinged/cleaved crystals in the lower center. .
JC9473. Barite. Cerro Warihuyn, Miraflores, Huamalies province, Huanuco department, Peru. 6 x 9 cm wide. 131g. $65.00. Mass of gray crystals on matrix from this pretty much exhausted locality. JC8931. Barite. Northumberland mine, Northumberland district, Toquima range, Nye county, Nevada. 5.5 x 8 cm 193g. $50.00. Chisel shaped crystals, with a smoky to amber color and highly translucent to transparent. The upright crystal in he center has a large chip out of the termination, visible in this photo. JC8932. Barite. Northumberland mine, Northumberland district, Toquima range, Nye county, Nevada. 7 x 7 cm 251g. $75.00. Minor chip/ding on a smaller crystal termination on the upper right, otherwise fairly clear of damage. JC8933. Barite. Northumberland mine, Northumberland district, Toquima range, Nye county, Nevada. 6.5 x 8.5 cm 384g. $75.00. A 5.5 cm crystal standing vertically from the base of other crystals. The main upright crystal has some minor dings on the left side of the termination, visible in the photo. A couple of the other smaller crystals also have small dings/chips on their terminations. JC8934. Barite. Northumberland mine, Northumberland district, Toquima range, Nye county, Nevada. 5 x 7 cm 182g. $45.00. The upper left main crystal has a chip/ding on the left side of the termination visible in the photo, otherwise fairly clean of damage. JC8936. Barite. Northumberland mine, Northumberland district, Toquima range, Nye county, Nevada. 7 x 14 cm 712g. $175.00. The largest crystal is doubly terminated and 6 cm long. The bottom end where it was in contact with the matrix is damaged, otherwise the other crystals look pretty free of significant damage. JC8937. Barite. Northumberland mine, Northumberland district, Toquima range, Nye county, Nevada. 5.5 x 6.5 cm 203g. $35.00. Some damage to three of the crystals. JC8938. Barite. Northumberland mine, Northumberland district, Toquima range, Nye county, Nevada. 4 x 7 cm 127g. $25.00. Dings on all of the crystals, visible in the photos. JC8939. Barite. Northumberland mine, Northumberland district, Toquima range, Nye county, Nevada. 5 x 7 cm 202g. $50.00. Chip out of the main crystal visible in the photo, but less obvious to the naked eye. Small dings on two of the lesser crystals. JC8939. Another view. The white area on the main crystal is a growth defect, not damage. The chip on the termination is above the white area. JC8767. Barite. Northumberland mine, Nye county, Nevada. 7 x 9 cm 434g. $150.00. Probably collected in the 1970's when several pockets were uncovered at this great barite locality. A few minor chips here and there, overall in great shape. JC8495. Barite on galena. Huanzala Mine, Huallanca District, Dos de Mayo Province, Hu�nuco Department, Peru. 4 x 5.5 cm 113g. $50.00. 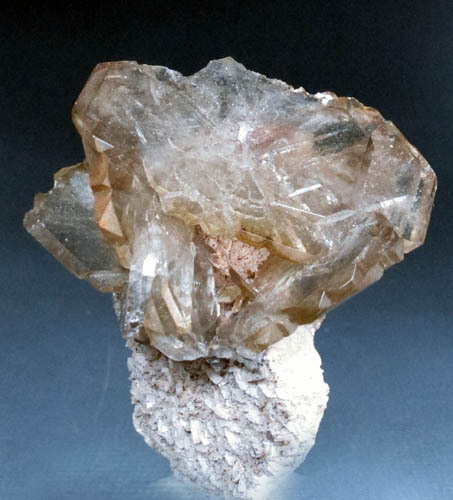 Nicely situated spray of barite on shiny, silvery-blue galena crystals. I chose this one for its showy aspect with the barites nicely situated on top of the galena. There is one cleaved barite blade, and it is visible as the shiny edge in the middle of the barite in the photo below this one. Purchased in 1997. JC8495. A view showing the one cleaved barite blade. Not obvious when displayed as above. JC8495. I over-exposed this one a bit to show the shiny galena better. JC8276. Barite. Cerro Warihuyn (Huarihuyn), Miraflores, Huamal�es Province, Hu�nuco Department, Peru. 3.5 x 4.5 cm 23g. $35.00. A sharp, complex single crystal. JC7924. Barite, chalcocoite, pyrite. Huanzala mine, Huallanca district, Dos de Mayo province, Huanuco department, Peru. 5 x 7 cm 106g. $125.00. Bright white barite crystals on a matrix of micro crystalline chalcocite and pyrite. Chalcocite is one of the rarer minerals at Huanzala and very few specimens of it have been forthcoming from this mine. ON SALE, TAKE 20% OFF THE MARKED PRICE. JC7916. Barite, quartz. Murray mine, Jerritt canyon, Independence range, Elko county, Nevada. 3.7 x 5 cm 56g with stand. $35.00. Sparkly drusy quartz coating/partly coating white barite crystals. JC7783. Barite. Meikle mine, Bootstrap district, Elko county, Nevada. 3.5 x 6.5 cm 58g. $30.00. One small cleaved crystal, otherwise in good shape. JC7781. Barite, quartz. Murray mine, Jerritt canyon, Independence range, Elko county, Nevada. 7 x 14 cm 586g. $275.00. Pseudo cubic barite crystals coated by sparkly drusy quartz. These are no longer coming out from the mine, and represent one find in the ore zone several years ago. This is a superior specimen from this find. JC7781. Another view. The yellowish color is a reflection, as the crystals are quite white. JC7738. Barite, quartz. Warm Springs, Tybo district, Hot Creek Range, Nye county, Nevada. 4 x 4.5 cm 68g. $30.00. Nice sharp crystal from this unusual location. The front has the slightest hint of a sort of violet color, while the side is yellowish. The back is coated with drusy quartz. JC7474. Barite. Sidi Laheen mine, Nador, Nador province, Oriental region, Morocco. 5 x 5 x 7 cm wide. 225g. with stand. $300.00 These have been coming out for a year or so now. Most all of them have some damage or discoloration. A fine group like this is quite unusual. A tiny bit of limonite matrix is attached to the bottom. There is one crystal, about dead center that has the very tip cleaved off. It is invisible except on close inspection, and in no way detracts from the specimen. This is a good one. JC7087. Barite, pyrite. Quiruvilca, Santiago de Chuca province, La Libertad department, Peru. 9 x 13 cm $200.00 Up to 30 mm gray blades, 4 of which are cleaved, but not noticeable except on close inspection. Ex. Dan Belsher collection #3180. Collected prior to 1993. One of the better examples of barite from Quiruvilca I have seen. JC6873. Barite, quartz. Xikuangshan mine, Hunan, China. 6 x 7 cm 208g. $35.00. 6 x 6 cm crystal on drusy quartz backing. ON SALE, TAKE 20% OFF THE MARKED PRICE. JC6791. Barite. Cerro Huarihuayun, Miraflores nr. Llata, Huamalalies prov., Huanuco dept., Peru. 5.5 x 6 cm 153g Now $200.00. A 4.5 cm single crystal with smaller ones in front of it. There is a small saw mark on the front of the matrix as can be seen in the photo. Very nice crystals. They are slightly darker in real life, and highly translucent to transparent in places. The larger crystal has been repaired along a cleavage line near the matrix, which cannot be seen except with the closest inspection. I lowered the price from $300 when the crystal fell off and I repaired it. ON SALE, TAKE 20% OFF THE MARKED PRICE. JC6791. A slightly different angle. JC3401. Barite, dolomite. Cerro Huarihuayun, Miraflores nr Llata, Huamalalies prov., Huanuco dept, Peru. 5 x 7 cm. $50.00. 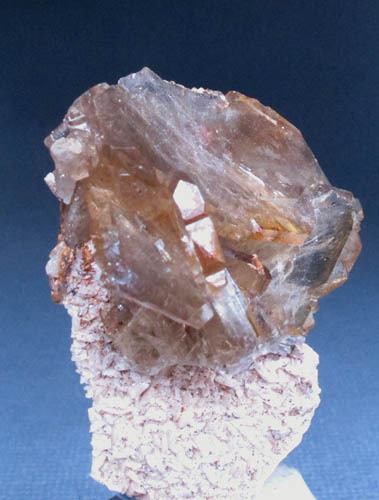 A 4 cm "flower" of barite on a stem of dolomite. The top edge of the barite was emplaced against the pocket wall, which made the edge of the crystal rather rough looking. JC3401. A side view of the piece. JC7679. Barytocalcite. Alston Moor, North Pennines, United Kingdom. 7 x 7 cm 335g. $60.00. A rather good specimen of this uncommon mineral for these days. Two views are shown. JC8949. Beryl (aquamarine) scepter. Shigar valley, Skardu district, Baltistan, Gilgit-Baltistan, Pakistan. 2.7 cm tall. $50.00. Neat little scepter thumbnail. JC7891. Aquamarine, foitite. Erongo mountains, Erongo region, Namibia. 5 x 5 cm 33g. $90.00. A 3.5 cm long white beryl with a green tip. JC7836. Aquamarine, schorl. Erongo mounntains, Erongo region, Namibia. 4 cm tall. $50.00 A pale ice green crystal with schorl crystals covering the sides. JC7698. Beryl var. Aquamarine, schorl. Erongo, Usakos-Omaruru, Namibia. 5 x 8 cm tall. 50g. $65.00. Stack of pale ice blue crystals with schorl scattered around for contrast. A black schorl crystal is implanted on the top terminations of the aquamarine. JC6233. Beryl. Trout Creek mine, Deep Creek mountains, Juab county, Utah. 3.5 x 5 cm 66g. $10.00. A bunch of crystals, very light blue, with minor muscovite. JC7829. Betafite. Ambolotara, Betafo Commune, Betafo District, Vakinankaratra Region, Antananarivo Province, Madagascar 2.5 x 3 x 3 cm crystal. $90.00. Neatly zoned? crystal. Not sure if it is zoned or just growth layering. JC8584. Bixbyite, topaz. Topaz mountain, Thomas range, Utah. 4 x 6 cm 50g. $30.00 A 6mm crystal with a few tiny topaz crystals scattered about. JC8722. Boleite. Santa Rosalia, Boleo district, Municipio de Mulege, Baja California Sur, Mexico. 4 x 4.5 cm 33g. $50.00. A 4 mm and smaller crystal on the typical clay like matrix. JC8722. Rather blurry close up. JC8521. Boulangerite, marcasite. Mina Noche Buena, Zacatecas, Mexico. 2.5 x 3 cm 5g. $50.00. A rare association specimen from this locality. Mindat does not list marcasite from here, although the boulangerite looks fairly typical. JC9205. Bournonite, pyrite, quartz Viboras mine, Machacamarca, Machacamarca district, Cornelio Saavedra province, Potosi', Bolivia. 3.5 x 5 cm tall. 55g. with stand. $150.00 Several crystals with bright satiny luster with minor quartz and pyrite. Hard to find miniature from this location. JC7748. Bournonite. Yaoganxian mine, Yizhang county, Hunan province, China. 3 x 4.5 cm 73g. $180. 00 Two bright, silvery black crystals. Some damage to the back side. ON SALE, TAKE 20% OFF THE MARKED PRICE. JC7642. Bournonite. Quiruvilca Mine, Santiago de Chuco Province, La Libertad Department, Peru. 3 x 4.4 cm 18g. $35.00. Several crystals on matrix. A couple are dinged and one is broken. ON SALE, TAKE 20% OFF THE MARKED PRICE. JC8168. Brochantite. Douglas Hill mine, Artesia Lake, Yerington district, Lyon county, Nevada. 6 x 8 cm 492g. $60.00. Emerald green brochantite crystals coat the face of this excellent specimen. Some of the brochantite is gemmy. From an early 1990's discovery in the mine. The photos do not do this specimen justice. No more collectible material has been found since this discovery.